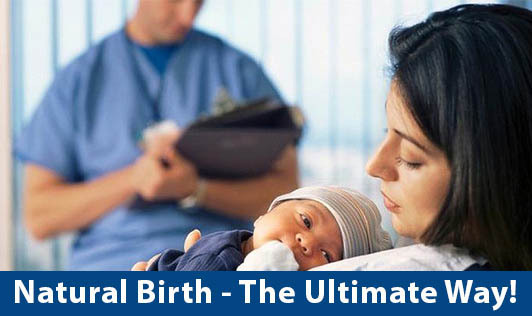 Natural Birth - The Ultimate Way! There is a saying which goes "Women's bodies have a perfect knowledge of childbirth; it's when their brains get involved that things can go wrong." - and it is so true! Natural childbirth, which is also called as un-medicated childbirth, has many unrevealed benefits which should be known by all women of child-bearing age and, more importantly, by women who are planning to attain motherhood. In our society, most of the women are terrified of labor pain, which has made doctors assume that every woman who is about to undergo labor, needs a pain medication. These medications can leave behind medicine residues in the mother's and the baby's body. I would like to share a few points on the benefits that natural birth can have on the baby and the mother. • Pain can be beneficial to the mother as she can know what stage of labor she is going through, when she may need to change positions, and when it is time to push. • The mother will not experience side-effects of medicines like vomiting, nausea, headache or dizziness. • She can get up and walk around within few hours of giving birth. • She will be less groggy after birth. • Mothers who undergo natural birth procedures, can heal faster when compared to the process of a C-section. This will result in shorter hospital stays and a quicker return to a regular routine. .
• The mother will feel more positive and empowered after having a natural childbirth. It is a great sense of accomplishment and a rewarding event. • The baby will be less groggy and more alert after birth. • The infant will have a lower risk of fetal distress during delivery and can be put on breast feeding with ease. • The baby will not have narcotics or other medicine residues in his system. • The baby will be more active, alert and healthier than other babies delivered with drugs. • The infant's APGAR scores (Appearance, Pulse, Grimace, Activity and Respiration) will be higher. With these points in mind, it is evident that our traditional, natural ways of delivering the baby is the healthiest and the best option for both the child and the mother.